I’ve often noticed the areas in my forest that are regenerating well; ‘long live the weeds and the wildness yet’* that is so much a part of a healthy forest. If I look carefully and low down its hard not to miss all the young Ash trees coming up in their thousands that have appeared since we have selectively harvested our monoculture conifer plantation to transform it to a mixed species, permanent, non clearfell (clearcut) forest. thanks so much for your comments. I don’t speak French so you will forgive me for using Google Translate to understand your comment above. Yes, I agree we can’t forget that forests are the most evolved ecosystems. You are right, my forest, all 2.5 acres of it is a conifer plantation of Sitka spruce (its about 25 years old) but I am using Close-to-nature forestry methods since 2008 to transform it into a permanent, mixed species, conifers and hardwoods forest. I am very fortunate to have been on forest study groups with French forester Professor Jean-Philippe Scutz, Slovene Prof. Jurij Diaci and other leading permanent foresters with ProSilvaEurope.org and I am on the committee of ProSilva Ireland. I have learned so much from these foresters and in turn the forests have taught me a lot about deep sustainability in general. La forêt est la reine des écosystèmes dans l’évolutif sur la planète, mais l’original d’où provient le végétal est le marin.Tous les sols forestiers sont animés dans l’infiniment petit d’une faune perceptible et imperceptible.Elle est la vie avant qu’elle n’explose au grand jour.C’est cette couverture végétale qui a permit le travail des sols récupérés par l’agriculture pour produire. Les espaces forestiers n’ont pas obtenu reconnaissance et notre pauvre arbre ne trouve respect que dans les natures mortes.Le monde artificiel des humains est probablement irrémédiables dans sa marche dégradante de la Nature,de la vie, et de la planète par la rupture de ces chaînes organisées par les équilibres végétaux avec les sols.Ce qui nous apparaît est la résultante du refroidissement de la couche supérieure de la planète,laissant un champ de transformation de la roche par lessivage et accumulations d’éléments minéraux élaborés.Le jeu des ténèbres et de la lumière est nécessaire aux plantes et aux vie annexes.Quoi que nous fassions , la Nature et son évolution contourneront les actions de l’homme ,lequel trouvera une position moins satisfaisante dans le règne de la vie animée.On peut le penser et le craindre. The forest is the queen of ecosystems in changing the world, but the origin of the plant is marine. Our forest soils are animated with an infinitely small fauna both perceptible and imperceptible. Her life before us explodes daily. Great is this cover which allowed the tillage recovered by agriculture to produce. Forest areas have not received recognition and our poor forests is this respect dying -natures mortes. The artificial world of humans is probably irreversible in its march towards degrading nature, life and the planet by breaking these chains organized by plant balances with soils. It appears to us as the result of the cooling of the upper layer of the planet, leaving a field of transformation of the rock by leaching and accumulation of mineral elements élaborés. The dance of darkness and light is necessary for plants and life processes. What do we do? nature and evolution will circumvent the actions of man, which found a less satisfactory in the kingdom of life and can think animée. On fear. 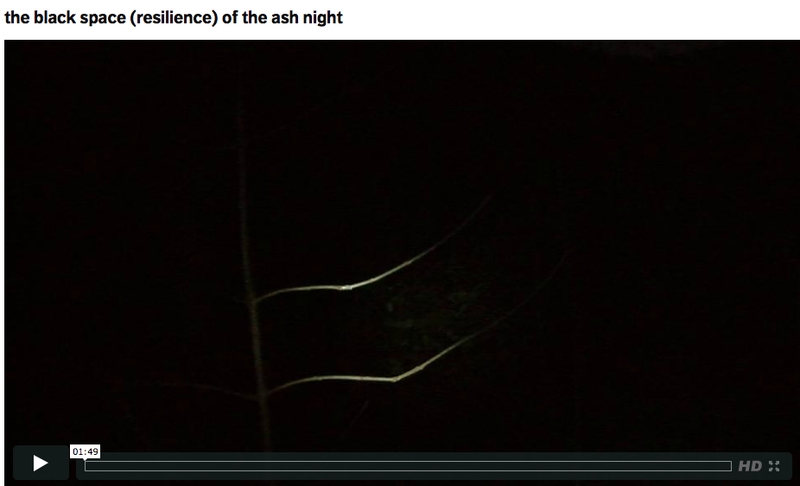 I was most struck by the line – “there is something oddly reassuring about young trees at night” – and might suggest you start with that line. I doubt I can add anything so beautiful as the previous comments but I do admire the blend of poetry and prose in your written description. There’s also a moment in the video when your dog walks out of the blackness and into the light that is wonderfully startling and reassuring. The eyes in the blackness evoke the ancient fear of wolves or being watched followed by the lollygagging (not quite bounding) gait of a trusted companion. The wild and domestic in one lovable body much like your like your own little patch of forest which must be managed in order to restore wildness. In the video I almost wished that the early shot where you pull focus on the bramble would be held just a moment longer so we can situate ourselves before the montage of ash branches begins. Minor details though, as this is enthralling. A blend of familiar and unfamiliar that only shooting at night can reveal. Its strange you mentioned wolves too, I was just saying something about them to a friend that day – my area in Ireland is the place where the last wolf was shot (around 1786 I think), another victim from the loss of Ireland’s great forests. At one time Ireland with its forests and wolves and woodkearne (forest dwellers) known as ‘Wolfland’ – now in parts it more often resembles Easter Island. So many now have forgotten the former and like Ireland’s current treeless and much poorer landscapes. Yes I think simplicity is key. I so remember that in your award winning film for the Copenhagen Climate summit in 2009. How you conveyed so much without a word of dialogue. Glad to hear your film company doing so well in India and that you are teaching now – not surprised at all. Glad you are enjoying the work; I am enjoying learning from my small forest. There is so much to learn from forests about long term deep sustainability, practices and ideas that are transferrable to other situations too. Excusez-moi d’être un bavard du mot.Mais je ne peux éviter de m’exprimer quand il s’agit de mes amis : les arbres.Leurs vies dans la durée sont sont considérables . Un millénaire est parfois,pour certaines essences une grande réalité;Leur monde intime réelle et intérieur nous avons du mal à le reconnaître.Mais,avec sentiments et juste reconnaissance, asseyez-vous au pied d’un de ces arbres âgés.Vous vous sentirez envahir par un sentiment d’une grande douceur,semblable aux bulles d’un bonheur proche .Parfois, cette douceur de la vie, est supérieure à celle que nous connaissons tous ensemble !Est-il un Maître du Monde sans se dévoiler,dans son secret intérieur.De par son règne ,il a préparé le nôtre.il n’en tire pas orgueil et bouleversement,mais il connaît avant nous la vie et les saisons dans le grand Souffle;Il nous dit que si nous l’aimions , il nous donnerait encore plus dans la simplicité du monde.La forêt et l’arbre ne sont pas de bois,mais de la grâce et la beauté d’un univers paradisiaque que nous ne comprenons plus . Merci pour vos textes forestiers dans une approche de la pensée sentimentale et artistique . you might like to subscribe to my other posts, goto the homepage and enter your email at the bottom right. I will be doing more posts from the forest and some forests books I use.